After Ecuador’s opposition staged a wave of protests over the weekend, President Rafael Correa struck back Monday, calling a massive rally of his own in central Quito. Supporters of Ecuador’s socialist-leaning government packed into the capital’s leafy Plaza Grande to hear the president deliver his first public speech in the capital since opposition protests erupted last week. The country’s right-wing has been infuriated by Correa’s plans to impose new taxes on large inheritances, and some in the opposition have called for the president to resign. The government has responded to criticism by pointing out the new inheritance tax will likely affect less than one in 3000 Ecuadorians – mostly from the country’s burgeoning upper middle class. Yet the opposition claims the tax is an undue financial burden on high income voters, and that Ecuador’s rich are being forced to fork out too much to fund Correa’s ambitious public services and infrastructure projects. 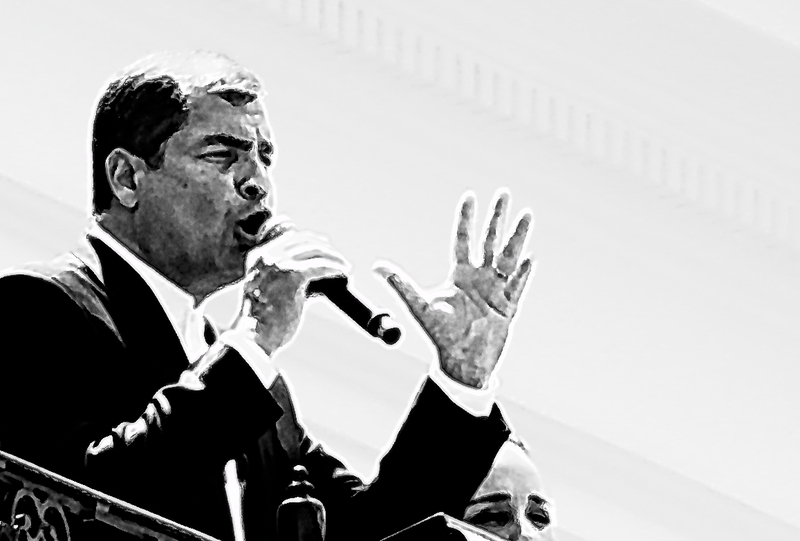 Collectively dubbed the “Revolución Ciudadana” (Citizens’ Revolution) these initiatives and other progressive reforms are wildly popular among Correa’s base – the working class and poor. In Plaza Grande, Correa shrugged off opposition calls for his resignation, instead arguing Ecuador’s rich are only being asked to pay their fair share. “All excessive wealth accumulation is unjust and immoral,” he said. The peaceful, upbeat rally contrasted starkly with the frustrated opposition protests of recent days. While fist-fights and broken bottles have marred the anti-government protests, Correa’s gathering felt more like a family-friendly festival than a political demonstration. The president himself presided over the affair with the charisma of a rock star, while urging Ecuadorians to support his revolution. “With peace, with joy, with conviction, we must all press forth to defend the revolution in every corner of the homeland,” he said.